The sea buckthorn (Hippophae rhamnoides) is a rustic species, which frequently grows on hills and mountains. This species has a high ecological plasticity. The sea buckthorn is resilient to frostbite, drought and wind. It grows on saturated, acid or sandy soils. It can amend the amend the eroded soils and it will fix the ridges and the mountainsides. 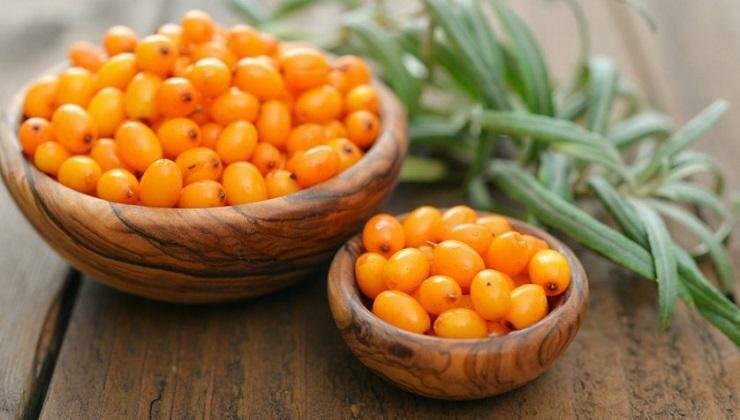 The sea buckthorn has large quantities of vitamins and nutritive elements, which are indispensable for the human body (C, A, B, K, iron, calcium, sodium, magnesium). 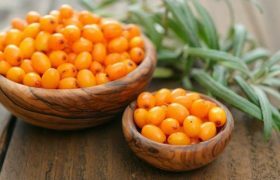 This is why the sea buckthorn’s fruits can be used both in the pharmaceutical and food industries. The sea buckthorn is a shrub which grows as a bush under natural conditions, it can reach up to 1.5 to 5 meters height. In areas where the climate is harsh (high altitudes or arid areas), the sea buckthorn will grow as a creeping shrub. This plant is dioecious and unisexual. The male plants are more vigorous, its annual growths are longer, darker, and its sprouts are visible more developed. The male flowers grow on the annual branches and they are grouped in cone formations, with a brown color. The male flowers blossom earlier than the female flowers. The female flowers blossom when the leaves emerge, and these are grouped as a raceme typed inflorescence. The female buds are more compact and they can be rarely found on the branches. The blossoming period ranges from March to April. The pollination process is done by the wind. This is why the male – female plants ratio is 1:8. The shrub’s stem is green and smooth, it turns darker as time passes. The sea buckthorn also have many thorns, which are sharp and very resilient. All the plant’s vegetative growths have these thorns. The leaves are small, covered with gray colored scales. The leaves have a thin limb and are placed on both sides of the branches. The root system is well developed, both vertically and horizontally and it has a side-roots growing capacity. The secondary roots form symbiosis with the bacteria from the atmospheric nitrogen. The fungi’s mycelium gets into the roots through the absorbing hairs, as a result of a chemical attraction process. The bacteria will develop inside the knots and it will stop the atmospheric nitrogen, making it accessible for the plant. The shrub will provide the bacteria with the needed sap for its growth and development. The fruit is a fleshy berry, of an orange color. The fruit starts its maturation process at the beginning of August and it ends it during the last days of October. During its production peak, the quantity of harvested fruits can reach up to 25 tons per hectare. After 18-20 years the crop will enter a downfall period, when the productions will considerably decrease. This species has high light requirements. If there is a lot of shadow, the plant will rapidly loose its foliage. This plant doesn’t have temperature demands. It can withstand the frostbite from winter, surviving to -40 degrees Celsius temperatures and it is not affected the excess summer heat, surviving temperatures as high as 45 degrees Celsius. It lives well on all types of soils, including the eroded, sandy, rocky ones, but it doesn’t like soils which have excess humidity. Even though this species has a high ecological plasticity, large productions can be obtained on soils with a south exposure, even, with a high permeability and fertility. The soil’s pH must not be under 5.5, the soils must not suffer from the excess humidity. Good results can be obtained on the soil which are close to the rivers, where the groundwater must be at least at a 1.5 meters depth. 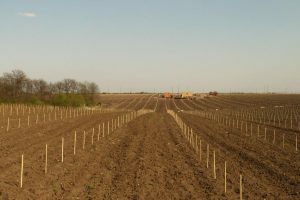 The parcel where you intend to start the sea buckthorn crop, must be cultivated with grains during the previous year. The following step would be to gather all the vegetal residues, and, during summer, plough the soil at a 60-70-cm depth. During autumn, plough it at a 25-35-cm depth. After this, the soil must be minced so that the sea buckthorn crop could be planted on a proper soil. The correct planting period is during autumn, in October. If for some reasons, the crop cannot be planted during autumn, you can do this during early spring. The planting distances must be chosen depending on the technology which needs to be applied for this crop. For slippery slopes, the distances between the rows must be smaller. Example: 3-m distance between the rows and 2-m distance between the plant of each row, 4-m distance between the rows and 2.5-m distance between the plants on each row, or 4-m distance between the rows and 1.5-m distance between the plants on each row. After choosing the needed planting scheme, the parcel needs to be marked. This consists of placing a stake on the soil where each plant needs to be. When doing this, please bear in mind that there will be a ratio between the male and female plants. This is 1:8. This means that 12% of the plant will be male plants. The male plants will have to be placed on upwind to assure the spreading of the pollen. The following steps need to be digging the holes and planting the sea buckthorns. The holes can be dug either manually, or mechanically. The holes need to be 40 x 40 x 40 cm. Place around 8-10 kg of well decomposed organic compost in each hole and around 40-50 grams of complex NPK fertilizer. These fertilizers need to be mixed well with the soil taken out of the holes. 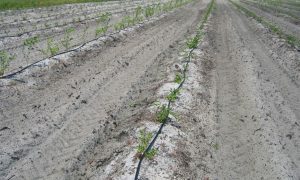 Before planting, the roots need to be cleaned up. This will remove the wounded parts of the roots. It will also rejuvenate the plant’s root system. The dead roots need to be completely taken out, and the living ones need to be only 20-22-cm long. After the roots have been cleaned up, they need to be placed inside a mixture of yellow soil, cattle organic compost and water. This will help the shrubs better adapt to the new environment conditions. This mixture must have a creamy consistency. 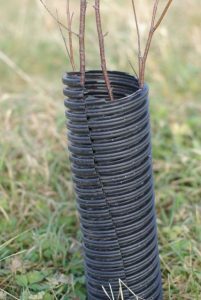 The planting phase needs to be done by 2 people, so that the roots could be placed widely spread inside the holes and the plant is vertical. The first person needs to hold the plant in its proper position, while the second will cover the holes and gently press the soil surrounding the plant. 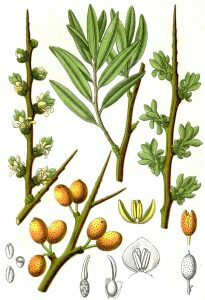 The most common sea buckthorn species are: Clara, Mara, Dora, Cora, Andros, Maracineni 1, Delta 1, Delta 3, Serpeni 11, Victoria, Auras, Ovidiu, Tiberiu, Pitesti 1, Pitesti 2. During the first 2 years from planting, pay an extra attention to taking care of the plantation soil. The young sea buckthorn plants are very sensitive towards the weeds growth, as the weeds will severely affect their growth and development. 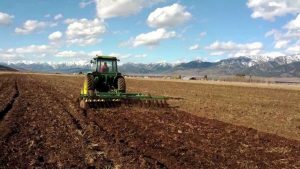 The soil must be kept clean at all times, by repeatedly ploughing it, manually or mechanically. It is forbidden to use herbicides during the first vegetation years, because the sea buckthorn plants are sensitive to these substances. Destroying the weeds can be done mechanically. The soil needs to be earthed up at a 8-10-cm depth, not to destroy the shrub’s roots. Where the is an impending danger of rodent attacks, the shrub’s trunk will have to be protected using strips of paper, nets, etc. After a while (2 years), the roots of the sea buckthorn plant will start to form their knots, which will gather the nitrogen from the atmosphere and will make it available to the plant. The shrubs need this element to fulfill their growth, development and fruitions processes. Starting with the third year, the plant will need extra fertilizers. We recommend applying 150 kg of ammonium nitrogen per hectare, 200 kg of superphosphate per hectare and 10 kg of calcium bicarbonate hectare, annually. 20-30 tons of organic compost need to be applied per hectare, once every 3-4 years, is this accessible. Irrigations are really important as this increases the productivity. 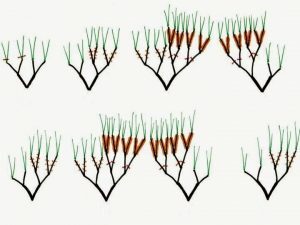 During the first 2 years, the extra water intake helps the plant grow and form its foliage, but it also increases the plant’s grasping capacity. The irrigations must keep the soil humidity at 80-90% for the heavy and medium soils, and for the lightly textured ones the humidity must be 60-70%. The recommended water dosage needs to be calculated depending on the soil’s properties and the environment. The applied water dosage must range from 300 to 400 cubic meters per hectare. We recommend sprinkler or drip. The cuts are an essential part of the crop technology. Their purpose is to help form the foliage, favor the fruition and ease the maintenance and harvesting procedures which need to be carried out. The sea buckthorn is not affected by the applied cuts and these cuts can channel the plant’s growth in many directions. For the commercial crops, the most common growing shapes are: a globular foliage or a flattened foliage. These cuts must be done annually, because the fruit bearing buds move towards the exterior of the foliage, the plants will slowly lose their foliage. These cuts need to be applied when harvesting, and if it’s necessary, this process can also be extended during the vegetative rest period. Pick the central axle of the shrub right after planting and shorten it to a third of its length. During the second and third year, pay attention to forming the main branches. These need to be placed on the axle at a 30 cm distance between them and on both sides of the branches. During the following years, the foliage must have its final shape, and this is when the cuts meant to help the fruition process need to be applied. In this case, the most simple method to be used would be to cut the vegetative growths and the fruit bearing growths from one side of the foliage. During the following year, the cuts will have to be applied on the other side of the foliage. This is how the foliage will rejuvenate every year and produce fruits every year. This will have to start when planting. Choose a main stem and 2 side branches which grow along the rows. The central axle needs to be shortened and left at a 30-40-cm height, and along with the 2 side branches, it will form the crop’s first layer. During the following years, choose other 2 side branches, which are located at a 25-30-cm distance from the first layer, these will form the following layers of the foliage. The growing buds of the side branches need to be shortened by a third of their size to favor the leaf growth. The side structure will grow on these side branches. These need to be cut once every 12-15-cm, and shortened at a 30-cm length. This is a very important step in the crop technology. For more information about the diseases and pests which affect this crop, as well as the proper prevention means, please click here. This is the most complex step in the plant’s crop technology. The fruits are tightly placed on the branches. The fruits are well connected to the branches and it get easily wounded during harvesting. On the other hand, this firm grip, allows late harvesting, as the crop can be harvested until the early days of spring. The correct harvesting period can be calculated depending on the purpose of the production and the intended harvesting method. 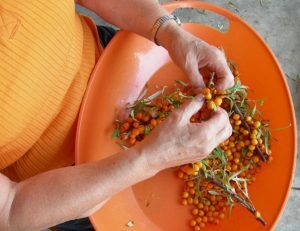 Usually, people harvest the sea buckthorn from the last days of summer until the last days of autumn. This process can also be done manually, mechanically, or by cutting off the branches. The manual harvesting process can only be done by workers and this method has a low efficiency. A worker can hand pick around 15-20 kg of sea buckthorns per day. The mechanical harvesting process is the most efficient one. This needs to be carried out using a machine which shakes the shrubs, making the fruits fall on the polyethylene soil placed on the ground. Besides these 2 methods, he sea buckthorn can also be harvested by cutting off the branches. The heavy branches which were cut off need to be transported to special equipped storage places, where the fruits will be detached from the branches. This last method has a medium efficiency (20-30 kg per worker), but if done improperly, it can negatively affect the next years’ productions.